Ah, Blink. You are the ability that mages and their fans and detractors both love, and love to hate. You were the topic of a question at Blizzcon, even. A slightly whiny mage asked the devs when they would be able to stop the dreaded Blinking Backward – because it was killing him in arenas. Fairly predictably, their answer was: “Blink in the right direction.” More seriously, they added that the “backwards” blink happens in reaction to (as mages know) slightly uneven ground, an obstacle, or some other landscape abberation. It’s an unavoidable reality of blinking. They encourage people who find these landscape issues (read: almost all of the landscape) to send in the specific location so that they can pay attention and fix it! Partly, I think they’re actually serious, and partly I think we just learn to live with it. But despite some of its flaws, I am here to tell you non-believers or those who just don’t know… Blinking is awesome. You learn how to do it at level 16, and you shouldn’t stop once you do. Here are some things you should know about blink. Blink isn’t static. That’s a mage joke, there. (Because it moves, get… nevermind. OR even better it’s like anti-static cling, because we wear robes, right…?! Nevermind). My point is, you can alter the way Blink behaves through the use of talents and glyphs. Glyph of Blink will increase the distance of your blink by 5 yards. I actually used this glyph for a brief time for a specific PvE encounter. It can be situationally useful! The only risk with it is that if you are used to blinking and have played your mage for quite awhile, it can completely throw off your rhythym. Additional distance might have some PvP application as well, this one’s up to you. Improved Blink (in the Arcane talent tree) is now actually a very interesting talent. Previously, this talent reduced your chance to be hit by spells/attacks by a percentage after you blinked. It might have been useful for PvP but was largely passed over by any viable PvE build. Improved Blink nowadays is quite a different matter. It increases your movement speed by a whopping 70% for three seconds, every single time you blink. Anyone who has had to run out of fire or move during a fight knows how invaluable this can be. A word of caution to all you enthusiastic blinkers: Practice blinking around after talenting into Improved Blink. You can and will drop yourself off the edge of the Lich King’s platform like a complete doofus. I’M JUST SAYING. Not that I know anyone who would have done something like that. Firstly, I am far from the first mage to write about Blink. In fact, Euripedes wrote a great guide to using Blink and Slow Fall – over a year ago. I read it at the time and remembered it now – he covers raid content from Naxxramas through Trial of the Crusader, but of course ICC wasn’t yet out when his post was written. Here’s where I like to blink. (Please note: all of my remarks refer to the heroic versions of these fights, but in most cases apply equally to their normal counterparts). When you are the unhappy target of the spidery creatures that like to web wrap people – if you pay close attention you can blink out of their trap. You have to blink before you’re actually “wrapped” otherwise you are stunned, but if you blink soon enough you’ll never be trapped at all. The implications here are pretty far-reaching and obvious. Blink will move you away from Marrow’s bonestorm, fast. It will also bring you back to huddling up behind him quickly so you can get back to DPSing, as well as allow you to move over an inconvenient patch of coldflame. Blink is invaluable for this fight. Useful for moving around, you can blink to the opposite side of the room from a vengeful ghost – or quickly out of a Death and Decay. Use blink to keep up with the tanks as they drag LDW towards the stairs for the last phase. Use blink to not be in anybody’s whirlwind. Actually blink has limited applications here. I tend to be so busy nuking things I don’t have to move very much. Blink is excellent for making sure you don’t get your face eaten by a blood beast you’re trying to burn down. When in doubt, use blink to buy yourself a few precious seconds. If your team collapses in the centre as ours does, you can use blink to easily group up for spores (or save it and use it to quickly blink out again once you have the buff). It’s perfect for an emergency drop-off of a spore in melee range, should both spores happen to affect ranged DPS or healers. There’s no one better for this than a mage! Previously very useful for ooze delivery and general movement – blink has been completely broken in this room since 4.0 (at least that’s the earliest we noticed it). Blinking anywhere here will cause you to move precisely nowhere. Is this one of those specific locations Blizz was asking about? There couldn’t be an encounter more suited to rapid movement! Use blink to close distance when you have to swap diseases with someone. 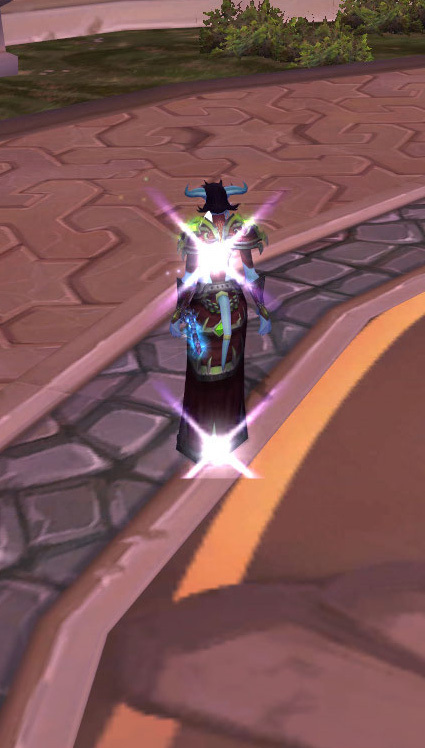 A mage affected by the green ooze’s targeting snare can also pivot and blink AWAY from it to buy the raid group precious time to DPS it down. Please note: exercise caution when using blink this way. Since damage caused by the ooze’s explosion is shared via proximity – if you blink away and your group is caught off-guard, you may end up dying alone rather than buying precious time. Blink is an obvious solution when you’re running from an orange ooze (and recent changes to fire have made it so that you can really DPS the thing even as you run!) Throughout phase 2 and 3, use blink to avoid Malleable Goo, ooze puddles on the ground, and to remain within range to DPS Putricide at every opportunity. I think blink’s uses here should be pretty self-evident – if you are a mage, you’re probably helping to keep orbs up in the air. Especially in the heroic version of this fight, where regular movement stacks a painful shadow debuff – blink really shines. I was once able to blink over and just barely catch an orb about to hit the ground. It was fabulous! Blink has limited application here because much of the fight is spent reasonably stationary. When you’re linked with someone else, you CAN blink towards them but I find that for reasons of lag it’s often better to just run instead. (Blinking completely past someone and extending the length of time you both have the debuff can put you and your team mate at risk). Do feel free to make use of Ice Block to thwart Swarming Shadows, though – and a desperate blink can save you if someone is a bit too close to you when Lana’thel is up in the air throwing blood bolts! p.s. – It’s not blink, but Slowfall is a nice gesture to drop down the hole after the fight. The courteous mage considers their friends! Let’s face it, this fight is just about adds for us. Blink can be a great way to close distance between you and some Suppressors, though. Back when I wasn’t playing a mage, my mage buddy would blink towards them, frost nova them to the ground – and we’d both quickly AoE them down. A mage with any form of slow (arcane and frost and even fire’s blast wave) can also kite one of the exploding guys. I can’t remember their name’s right now. Everyone’s favourite hoarse-voiced dragon, the ability to blink laughs in the face of Sin’s Blistering Cold. Let her pull you in and then happily blink away. 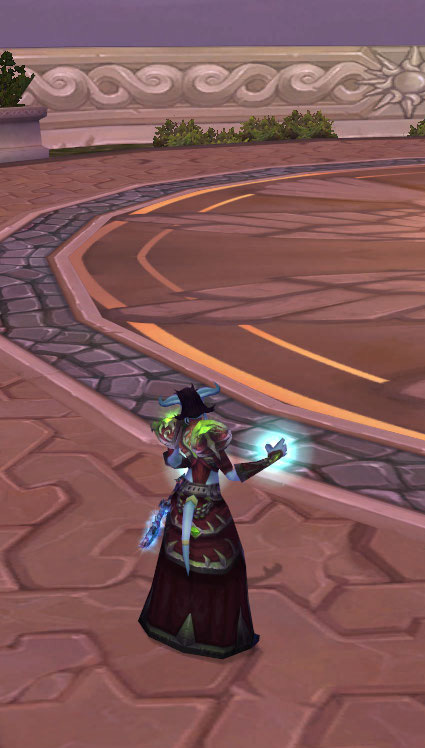 In the heroic version, if you’re affected by Unchained Magic, you can blink away from your team to your assigned spot, but keep in mind it’s adding to the damage you will take. Watch that timer carefully – just because you can blink out of danger doesn’t mean an untimely explosion from UM can’t hurt the people around you. Blink responsibly! Blink can be used in the first phase, but again with potential for risk – if you’re dropping off Necrotic Plague, you risk overshooting and being crushed by the frontal abilities of the Shambling Horrors. You can use blink to get to the outside edge with potentially disastrous results (see earlier) or more reliably, as a safe way back to the center, and an easy way to spread out for or avoid stepping in Defile. In phase three, use blink to help avoid damage from exploding Vile Spirits. Those were specific blink usages all throughout Icecrown. I’m not going to detail every place in a heroic where blink comes in handy, or in PvP – I think these are fairly self evident. Rather, I’ll just mention a few specific things Blink is useful for in general terms. Every frost mage’s best friend, blink is a simple way to put some distance between you and any enemy (or group of enemies). When used in combination with a frost nova you can immediately have the range you need to burn unsuspecting creatures down. I’ve actually found in PvP that blinking towards someone can completely disconcert them (especially with use of Dragon’s Breath or any other kind of frontal cone ability). Keep in mind, I don’t do arenas, so I have no idea there. But in a battle ground, surprise is an advantage however you get it. I’ve managed to burn some unsuspecting people who never thought the mage would blink…towards them. Obviously a judgment call, it’s not going to do you much good if you blink to your inevitable demise, but it has its uses. A somewhat lesser known use of Blink – if used while in the air, it will “transport” you to the ground. This can be used in conjunction with slow fall, although sometimes you just end up blinking forward and floating weirdly. It works more often than not, in my experience! Blink will break you out of many slows and snares, and stuns. Not all of them, unfortunately – but there’s no harm in trying, and usually harm in not trying! Mage pro tip: The last fight in Utgarde Pinnacle is a joke for us. Each time you are stunned, you can ice block (once) and then blink each subsequent time. You should have approximately enough time for blink to be off cool-down again by the time you need it. If you’re a human mage you’re laughing all the way – you can use Every Man for another of the stuns and definitely escape them all. Enjoy DPSing while your group hangs around and you do the dirty work. 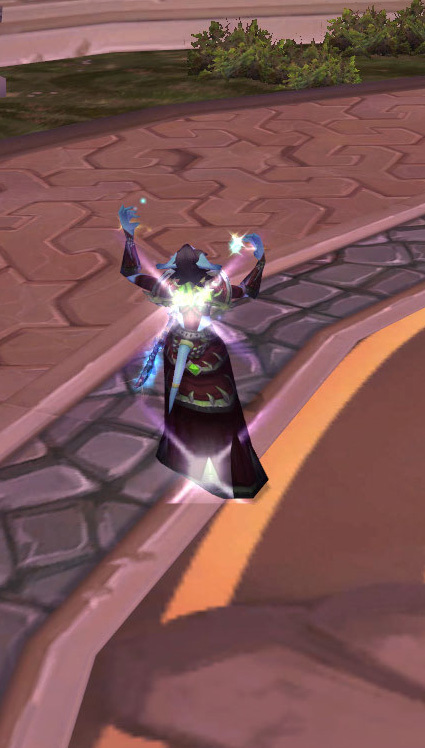 Love it, hate it, or use it on the edge of the Lich King’s platform and plummet to your inevitable death – blink is one of the spells that is most unique to mages! It gives us our incredible mobility and is useful in so many situations. I’m sure there’s some I haven’t thought of or mentioned (mages are so ingenuous). What are your favourite uses for blink, or your best blink stories? I look forward to hearing any I’ve missed, otherwise – happy blinking!